MIDLAND — Chemical giant DowDuPont Inc. reported net income of $1.77 billion or 76 cents a share in the second quarter ended June 30, up from $1.32 billion or 46 cents a share a year earlier. Revenue was $24.25 billion, up from $13.83 billion a year earlier. For the six months, net income was $2.87 billion or $1.23 a share, up from $2.21 billion or $1.79 a share a year earlier. Revenue was $45.76 billion, up from $27.06 billion a year earlier. The company also reported an “adjusted results” profit figure of $4.15 billion or $1.37 a share. That figure did not include integration and separation costs involving the Dow Chemical – DuPont merger and other restructuring, divestiture and merger charges and costs. Agricultural related sales were $5.7 billion, up 25 percent from $4.6 billion a year earlier, driven by sales recovery from weather-related delays in the Northern Hemisphere planting season, local price gains, and double-digit growth in insecticides. Materials Science sales rose 18 percent to $12.6 billion, while Performance Materials & Coatings sales rose 15 percent to $2.6 billion. Industrial Intermediates & Infrastructure divison sales rose 29 percent to $3.9 billion, while Packing and Specialty Plastics sales rose 12 percent to $6.1 billion. Electronics and Imaging division sales fell 1 percent to $1.2 billion, while Nutrition and Biosciences sales rose 19 percent to $1.8 billion. Transportation and Advanced Polymers sales were up 14 percent to $1.5 billion, while Safety and Construction divison sales rose 6 percent to $1.4 billion. 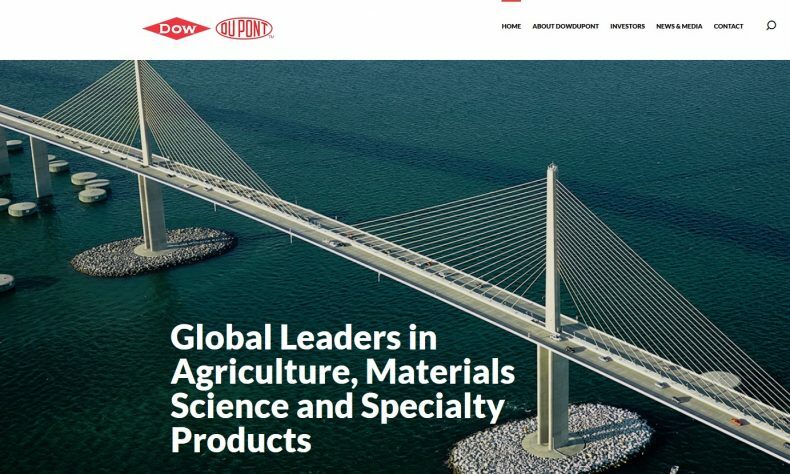 For a replay of the conference call discussing these results, and supporting presentation materials, visit http://www.dow-dupont.com/investors/events-and-presentations/default.aspx.